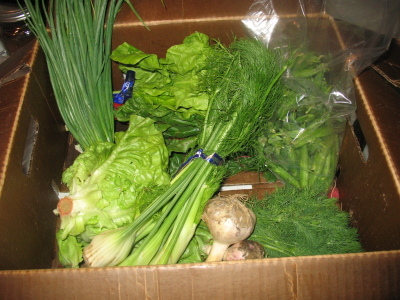 Our second CSA box came in, and with it, I've learned a few lessons. 1. I might be allergic to rainbow chard. That is, unless the stinging on my tongue and throat is perfectly normal. 2. Shell peas are not simply large snap peas. Ironically, you don't eat the shell of the shell peas. Or at least, it's not pleasant. It starts off just fine, and tastes exactly like a snap pea (you eat the entire pea pod of a snap pea), but then you discover that as the juice of the pea pod is worked out of the fibers, the fibers themselves don't break down. It's like chewing on wood chips after a while. 3. Raspberries don't always taste terrible. I don't generally like raspberries, but the ones that came with our box were so juicy and sweet, they weren't tart at all. I don't like tart. These raspberries were delicious. I have no clue what to do with all the dill and fennel we received. I'll have to figure out how to start preserving some of this stuff, so it doesn't go to waste. (grin) your wry observation that you "may" be allergic to chard brought a chuckle, as I too don't believe that stinging is a "perfectly normal" response. Chances are though, if you ate it raw the first time, cooking (read: light steaming) it will make it palatable. Fresh Dill and Fennel.. ah... the uses are endless...dill in a fresh cucumber/sour cream (or preferably unsweetened Nancy's Yogurt) and a little honey(considering your aversion to tart flavors) makes a mouthwatering raw veggie dip.. fennel bulb sliced thin and sauteed with ground anise seed (layering the licorice flavor), along with onions, black beans, fresh garlic and a little sea salt- hot or cold- a tasty side dish... yum. And kudos to you and your family for supporting Helsing Farms CSA..I look forward to hearing more about your experience. Speaking of fennel, I found this delightful recipe for fennel/pea soup, and in traditional Josh fashion, I didn't follow any of the instructions and just jumped in, trying to see what worked. Lesson learned: Too much fennel (ie., three whole bulbs in a tiny pot) is unpallatable. I hate to waste food, so I downed as much of my soup (that nobody else was willing to eat) as I could... and am now driven to nasea at the smell of fennel.